A spider web crack is a series of hairline fractures spreading out from a central point of impact. Bilal Tanweer makes this image the motif for his short story collection The Scatter Here Is Too Great. The central point of impact is a bomb blast at the Karachi Train Station in Pakistan. All the stories, eight total, radiate out from and connect back to that one point in time. Tanweer takes a “community” approach to the event. His characters are as interconnected as his stories; appearing, re-appearing and interacting with one another throughout the book; jumping from one story to the next; telling us about their lives before and after the explosion; gradually revealing their thoughts and feelings in first person narratives (with the exception of one story which is told in the third person present tense). All the narrators are male, predominantly young and speak in voices which veer from self-conscious vulnerability to the cocky arrogance peculiar to young men. More succinctly: these people, who we expect to be no more than a group of strangers whose collective bad karma has resulted in them being at the wrong place at the wrong time, know each other. For example: there is an elderly man, a Communist poet, who passes through several different stories. In one he recites his poetry on the bus and is derided by other passengers. Later we will see him again, on another bus, though the eyes of the troubled boy he sits beside and talks to. In yet another story we recognize him as the narrator’s grandfather, and then as another narrator’s the father, and then he has a brief cameo as the friend of the main character’s father seen from a distance. Sadeq, the boy on the bus befriended by the poet, narrates more than one chapter and over time describes to us what is a remarkably depressing life for one whose only advanced into his early 20’s. Through his story we are linked to another young man who was his childhood friend. And in this way, one thread at a time, we learn about the victims of the bombing. So that when the time comes to tend to the survivors and collect the dead, we have an understanding exactly who each of them is and was in that moment of impact. That is Bilal Tanweer’s super power as an author. He has a talent for creating beautiful & strange imagery out of life’s banalities. He’s willing to spend time on the insignificant things we all notice and just as quickly forget. Like a plastic bag blowing in the wind. My eyes were following the blue plastic bag that floated in between the onrushing cars. It curved sideways, rose and cruised and hung in the air, and finally ran into the path of a pedestrian who slapped it with the back of his hand and pushed it over the edge of the bridge. It limped over it and spiraled like a tiny tornado. Because, when you think about those men & women entering the Twin Towers on 9/11, or boarding trains in London on 7/11, or riding a bus in Syria on a Sunday morning – they were all having normal, ordinary, even boring, days. Until suddenly they weren’t. Tanweer skillfully conveys the individual’s sense of normalcy leading up to a catastrophic event, which is so unfathomable to the reader who already possesses the knowledge of what is about to happen, and then allows the environment to degenerate into the chaos and confusion that must inevitably follow. 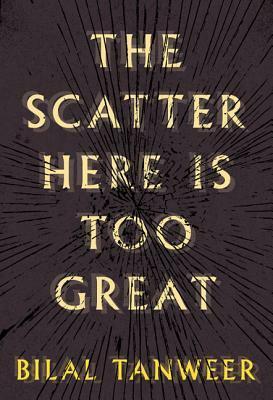 The Scatter Here is Too Great was on the shortlist for the DSC Prize. It was not selected as the final winner by the Shadow or actual juries – mostly because despite its ambition (or perhaps because of it) the book has integral flaws. The most obvious is how the voices of all the young men blend together as the book progresses. Less obvious, but ultimately more distracting, is how it works too hard at being a “concept” novel. The opening image of the spiderweb crack is an intriguing one, particularly as the story centers on a bomb blast, and so you want it to fall into place naturally. But Tanweer felt the need to insert (what I guess you could call) an element of metafiction: a writer who pops up to provide a sidebar commentary on what is happening and why. Tanweer doesn’t seem to fully trust his reader. He’s created this writer to explain the structural and creative process… and to a point it succeeds. I was surprised at how well all the stories fit together and played their part in the author’s greater narrative plan. But I didn’t see it until it was explained. And, like that blue plastic bag, I forgot about it just as quickly. One of the highest praises we as a society give to an artist is to say that he or she “makes it look easy”. While The Scatter Here Is Too Great delivers moments of promise, in the end Tanweer succeeds in making it look unaccountably hard. DSC Prize for South Asian Literature 2015 Shadow Jury – And the winner is…. But when Stu, Lisa & I started discussing which book should win it quickly became a process of elimination. We all agreed one book was good, but not a prize winner. Another novel two of us did not like, one of us did. Noontide Toll by Romesh Gunesekera was a close runner up. Publishers Description: It is the sunset of the Mughal Empire. The splendour of imperial Delhi flares one last time. The young daughter of a craftsman in the city elopes with an officer of the East India Company. And so we are drawn into the story of Wazir Khanam: a dazzlingly beautiful and fiercely independent woman who takes a series of lovers, including a Navab and a Mughal prince—and whom history remembers as the mother of the famous poet Dagh. But it is not just one life that this novel sets out to capture: it paints in rapturous detail an entire civilization. Of the five books shortlisted for the DSC Prize I only managed to read four. The Mirror of Beauty, at 985 pages, was the one book I didn’t manage to get to. There just wasn’t enough time. In the end both Stu’s & Lisa’s glowing recommendations of Shamsur Rahman Faruqi’s beautiful, epic novel made it the only possible choice. The official winner will be announced this Thursday, January 22nd. The city of Peshawar is located in Pakistan, 59.1 kilometers (approximately 36 miles) from the Torkham-Border Crossing into Afghanistan. It is at the end of the Khyber Pass which cuts through the Spin Ghar mountain range and connects the two nations. Until 1947 it was a part of British India. Go back even farther, c. 515 B.C., and the Persian Empire claimed the city. Kamila Shamsie layers over two thousand years of Peshawar’s history into her novel: A God In Every Stone. The city of Peshawar is located in Pakistan, 59.1 kilometers (approximately 36 miles) from the Torkham-Border Crossing into Afghanistan. It is at the end of the Khyber Pass which cuts through the Spin Ghar mountain range and connects the two nations. Until 1947 it was a part of British India. Go back even farther, c. 515 B.C., and the Persian Empire claimed the city. Kamila Shamsie layers over two thousand years of Peshawar’s history into her novel: A God In Every Stone – by setting it in the period between WWI and the Partition of British India and by using the Persian Empire -(and the tale of Scylax, a hero who betrayed his king) to bookend her story. It’s an ambitious novel. Vivian Rose Spencer is sent by her father to his old friend, Tahsin Bey, to take part in an archeological dig in the Labraunda region (located in modern day Turkey). It is 1914. For Vivian the trip is marked by a series of firsts – first adventure away from home, first taste of independence, first archeological discovery & first love. Tahsin Bey, the man who will be the great love of Vivian Rose’s life, tells her the story of Scylax of Caryanda. A sea Captain and Ancient Greek Historian, he is mentioned in Herodotus. In Tahsin Bey’s version of the tale the Persian King Darius I favored Scylax, the Greek explorer, and as a mark of his favor gave him a finely wrought silver crown of figs. But when Caryanda rose up against the Persians, Scylax betrayed his King and rebelled with his countrymen. * Tahsin Bey believes the crown exists and has spent his life searching for it. And then WWI detonates and turns Labraunda into an idyllic interlude very different from everything that follows. Vivian Rose returns home to London to nurse the wounded soldiers and we are introduced to Qayyum Gul, a Pashtun soldier, who travels to France as a part of the Indian Army. He will eventually lose an eye in the Battle of Ypres and be sent home to Peshawar. Vivian Rose, traumatized by the carnage of war she sees in the army hospital escapes back to India and archeology. These two will be bound, completely unbeknownst to them, by their affection for an engaging and intelligent boy. Qayyum’s younger brother, Najeeb, who will become Vivian Rose’s student and protegé. For the first time she gave him her full attention – a smiling boy with excellent but oddly pronounced English, as though most of his vocabulary came from books. He was dressed more formally than the day before in narrow black trousers, a white tunic, and a white turban with a grass stain which suggested he’d been standing on his head. They turned into another lane and Najeeb said it was the Street of Partridge Lovers, and looked startled when she laughed. – What else? Tell me all the street names! – The Street of Dentists. The Street of Potters. The Street of Felt Caps. The Street of Silver. The Street of Money-Changers. The Street of Coppersmiths. The Street of Englishwomen. – The Street of Englishwomen? – They buy and sell Englishwomen there. We will avoid it. – Take a detour through the Street of Inventive Guides if you must. He looked delighted to be caught out, and she found she was delighted to have been teased. All of which is only a very small part of a larger (and, in hindsight) messier plot that also includes the Khudai Khidmatgar or“Servants of God” – the Pashtun Liberation Movement with strong ties to Gandhi’s Indian Liberation Movement – led by Ghaffar Khan. Gandhi and Ghaffar Khan were good friends and shared a common philosophy of non-violence. Qayyum will become of follower of Ghaffar Khan and a member of the Khudai Khidmatgar and Pashtun Liberation. Against this richly layered historical backdrop Shamsie uses her characters to take a hard, unsentimental look at the relationship of two cultures interacting under the social constructs of colonialism & Empire. She accurately describes the injustice, prejudice, and inequality that existed in British India without dismissing the complexity of that relationship. She also takes an honest look at both cultures’ treatment of women. Vivian Rose’s father raises her as if he were the son he never had: “a compact early agreed on between them that she would be son and daughter both – female in manners but male in intellect”. He seems remarkably enlightened until we learn how he “set her right” on women getting the vote by sending her to an Anti-Suffrage League meeting. “If all women were like Ms. Bell and you, men would fall over their feet in the haste to give you the vote”. “- Are you to spend the rest of your life making up for my womb’s insistence on killing his sons?” her mother asks at a pivotal point in the sorry. A few months later, halfway across the world, Najeeb will find his four-year-old niece looking at one of his books. – Do you want to learn how to read? Najeeb sat down beside her as he spoke, both of them small enough to occupy a single chair. The child nodded her head, placed her hand on the page and said, Alif, Bey, Pay. Qayyum lifted her up in his arms, away from the book, away from Najeeb’s questioning gaze, and placed her on her grandmother’s lap. – Play with your doll, little one. A God In Every Stone is a lush, sweeping novel; ping-ponging between Britain and India; with a larger than average cast of characters. Shamsie paints every one of them (no matter how tertiary) so vividly as to confuse her readers into believing she is writing non-fiction. Preconceptions, projection & misunderstandings shape events. From the early chapters, where a young British woman and a wounded Pashtun soldier find themselves sharing a train compartment, to the final pages in which a single Pashtun man finds himself on a rooftop with a young Pashtun lady to whom he is not related – characters misinterpret and misjudge each others intentions. Shifting, third person narratives provide an array of perspectives – men and women who understand surprisingly little about themselves or each other. Sometimes with tragic, sometimes glorious, results. I wrote earlier that this was a messy novel. Let me clarify: A God In Every Stone is messy like a Charles Dicken’s novel is messy – crammed full of plot, description and people. Its character’s are imperfect, like those favored by E.M. Forester – committing multiple mistakes before reaching the end. So yes – I still hold Kamila Shamsie has written a messy, imperfect masterpiece. But a masterpiece nonetheless. *Carian Heraclides of Mylasa is a work attributed to the real life Scylax. In it Heraclides revolts against the Persians (during a Carian revolt c. 492 B.C. which was supported by the Greeks). The DSC Prize for South Asian Literature announced their shortlist on November 27th. The DSC Prize is not one I usually follow. At least not closely. Most of the books involved are written in English (as is the case with this year’s shortlist) and I’ve been focusing on translations to the exclusion of almost everything else these days. But Stu from Winstonsdad’s Blog & Lisa from the ANZ LitLovers LitBlog invited me to join their 2015 Shadow Jury and I accepted, of course. They’re two of my favorites and I was honored they thought of me. It was only afterwards that I realized that I had three weeks to read five books. Then, on the week of January 15th, we will meet in a three person MMA bare knuckle cage match to determine the winner. Three bloggers and five books will enter. Only one will leave. (Well, one blogger and one book – so that’s technically two. Only two will leave. Not as dramatic. And I probably should mention the whole MMA cage fight aspect to Stu & Lisa. I’m not sure they read the official DSC rules and guidelines for setting up shadow juries). 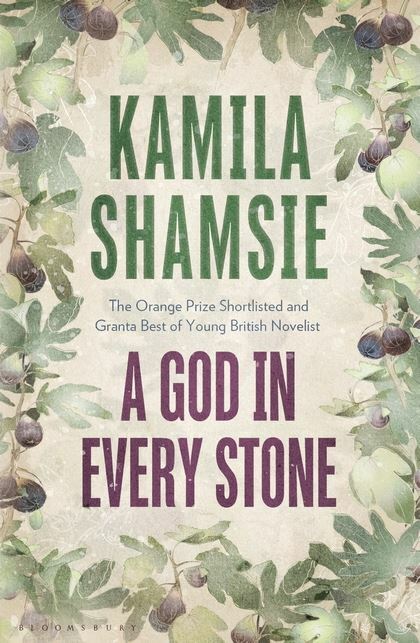 I’m three books in and working on a review of A God in Every Stone by Kamila Shamsie for the weekend – and so far I am pleasantly surprised. As mentioned in the previous paragraph, it’s doubtful that I would have gotten to any of these novels without the Shadow Jury incentive. A God in Every Stone was lovely and became one of my best novels read in 2014. A gorgeous World War I tale set in England & Peshawar (now a city in Pakistan, but during the period the novel is set still a part of British India) that works on multiple levels. Beautiful writing, vivid character portraits, evocative of a sense of place and historical urgency – overall as close to flawless as it gets. The Scatter Here Is Too Great by Bilal Tanweer was initially less satisfying because it felt disjointed, but became one of those books that brilliantly pulls itself together at the end. Described as a collection of short stories, the last fits in so neatly with the overall theme that it must have been intentional on Tanweer’s part. I just finished today and am still processing my relationship to it. Jhumpa Lahiri’s The Lowland is next on deck. She’s an author I’ve been meaning to get to for years (like Zadie Smith) but never actually got to. I imagine her as someone whose work a reader either connects with or does not – without purchase between. We’ll soon see if that’s true. The official winner of the 2015 DSC Prize for South Asian Literature will be announced on January 22nd.